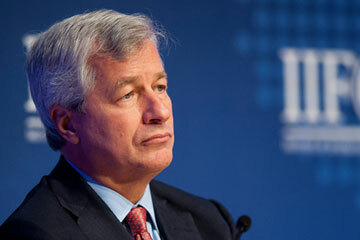 Jamie Dimon, chairman, president and chief executive officer of JPMorgan Chase & Co., listens during the Institute of International Finance Annual Membership Meeting in Washington on Saturday, Oct. 12, 2013. I find myself in the odd position of feeling sorry for a too-big-to-fail bank. JPMorgan Chase is reportedly ready to pay $13 billion to the U.S. government--potentially among the largest such settlements ever. The tentative deal, which is separate from other settlements that may be made with institutional investors, centers on alleged misdeeds in the selling of mortgage-backed securities, those spliced-and-diced housing-based assets that caused the 2008 financial crisis. It's supposed to allow JPMorgan to move beyond the sins of the crisis while also showing how tough the Department of Justice has gotten on banks, giving Main Street the warm feeling that Wall Street has finally paid for all the pain it caused. In reality it does none of those things. In fact, this mega-settlement would be in some ways the worst possible response to the economic destruction of the crisis and the Great Recession. For starters, it does absolutely nothing to make the financial system safer. Rather than clear, sensible rules that prohibit risky behavior on the part of banks, we get enormous fines for ... what, exactly? The details of the settlement haven't been finalized yet, so we don't know the specifics of what the fines are supposed to compensate for. We don't know which institutions and executives were considered at fault, or indeed whether there was any criminal wrong-doing. (Investigations on that score continue.) It's likely that many of the transgressions were actually committed by Bear Stearns and Washington Mutual, two institutions that JPMorgan bought--at the behest of Washington--during the financial crisis in order to stabilize the system. Aside from ensuring that no head of any major bank is ever going to want to help the government in similar situations again, the deal also has the worrisome aura of a populist shakedown. Officials appear more concerned about appeasing anger over the financial crisis than doing the harder and more politically contentious work of re-regulating the banking system properly. Remember, five years on from the crisis, only 40% of the rules called for by the Dodd-Frank reform law have been completed. "The amount seems almost poll-based, as if Washington surveyed voters and asked how big would the penalty need to be for people to feel like JPMorgan paid a fair amount," says behavioral economist and finance expert Peter Atwater, who worked for JPMorgan in the late '80s and early '90s. At the same time, the mega-settlement sends a perverse message. "If you are big enough and profitable enough, you can simply pick up the phone to the DOJ and cut a deal," says Mike Mayo, banking analyst at investment firm CLSA and author of Exile on Wall Street: One Analyst's Fight to Save the Big Banks From Themselves. "If you are ABC Community Bank somewhere in the Midwest, you don't have that option." It's true that $13 billion is a very big number--it's about $2 billion more than Google made in profit last year and roughly triple what BP agreed to pay after the oil spill in the Gulf of Mexico. But it's also what JPMorgan earned in profit in the first two quarters of this year. It's a hit, no doubt, but it won't cause lasting pain.